1.55 million households in the UK were helped by reuse charities and social enterprises in 2018. This is just one of the benefits of reuse shown in the Reuse Network Social Impact Report 2018 which is published today (Friday 23 November) to coincide with Buy Nothing New day, the ethical alternative to Black Friday. Craig Anderson, Reuse Network CEO says: “The last 12 months have been difficult for many reuse organisations, as we received reports of charities closing their doors due to financial constraints. In spite of this, the reuse sector has stepped up to ensure that households continue to access affordable furniture and electrical items. In addition to diverting 3.5 million items in the last year to households in need, the reuse sector supported over 52,700 people are supported through volunteering, training and work placements and employed around 5,500 people part-time and full-time. Craig Anderson says: “Our members go far beyond the provision of reused household items, they become a hub for their communities in providing key services and support networks”. rent-to-own goods is welcomed progress in protecting those more at risk of debt and financial crisis. The Reuse Network works to ensure that no-one is without a bed to sleep on, a cooker to cook on, or a sofa to sit on, wherever they live in the UK. The Reuse Network (formerly the Furniture Re-use Network) supports reuse charities across the UK to help them alleviate poverty, reduce waste and tackle climate change. Craig Anderson, Reuse Network CEO is available for interview. For the Reuse Network it is reuse that provides an answer to the UK’s serious waste problem – turning it into a solution for the alleviation of poverty instead. By shifting behavioural attitudes of the public and corporations and using innovative schemes such as retail take-back scheme and supporting product stewardship, the Reuse Network is a game-changer in putting the circular economy into motion. The Reuse Network Social Impact Report 2018 can be accessed from https://reuse-network.org.uk/charities-and-social-enterprises-in-the-uk-continue-to-step-up-to-support-households-in-the-need from Friday 23 November. Images are available to use and download here and to credit the Reuse Network. Buy Nothing New day is an initiative set-up by the Reuse Network, encouraging the public to swap Black Friday for Buy Nothing New day and shop at their local reuse charity. More than 30 volunteers have been thanked for their dedication and commitment to a charity in South Shropshire. The Furniture Scheme, based in Ludlow, hosted a barbeque to thank it’s loyal volunteers for the work they do. The event took place at the charity’s base Rockspring Community Centre, in Sandford Road. It saw volunteers from the centre joined by those who help in the warehouse on Weeping Cross Lane, the carpentry workshop, Renaissance shop in Tower Street, as well as those at Craven Arms Community Centre and The Charity Bookshop in Newington Way, Craven Arms. James Cooper, operations manager at The Furniture Scheme, said: “It was one of the hottest days of the year and everyone had a great time. 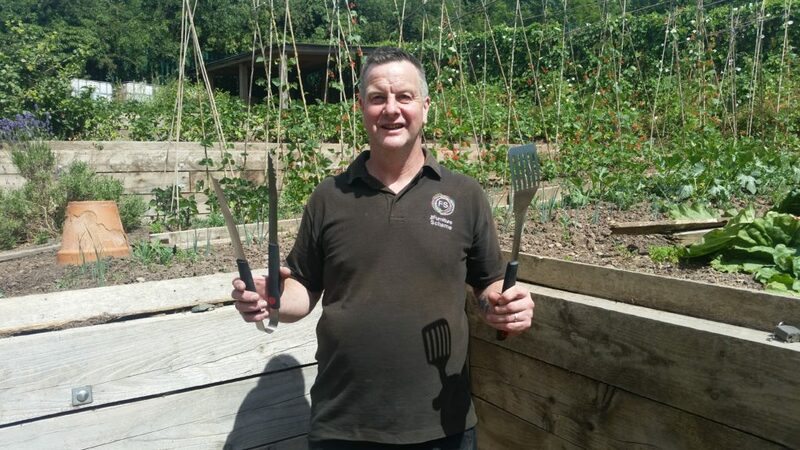 “Our caretaker Rob Gardner kindly cooked all the food with the help of volunteers. “We wanted to say a big thank you to all of our volunteers and this barbeque was a small token of our thanks. The charity has grown and now offers computer courses, carpentry workshops and volunteering in the garden, among other things across the six sites. Anyone who would like more information about The Furniture Scheme should call 01584 874922, email info@furniturescheme.co.uk or visit http://www.furniturescheme.co.uk. Anyone who would like to volunteer or answer this cry for help, or for more information about The Furniture Scheme, should call 01584 874922, email info@furniturescheme.co.uk or visit http://www.furniturescheme.co.uk. A charity stalwart from south Shropshire has been honoured by the mayor of Ludlow for the work he does in the community.Terry Round, 75, of Ludlow, has been a volunteer at The Furniture Scheme for 12 years and spends most of his time in the charity’s workshop in Friars Walk. He will have stripped, polished and painted hundreds of pieces of furniture over the years – and now he has been presented with a Civic Award to say thank you for his hard work. But modest Terry said he just does it because he enjoys it. “I was gobsmacked when I was given the award, I thought it was just a meeting,” he said. “It was unexpected, I like to stick to the background and just take it as it comes. I don’t see what I do as anything special, I am here because I enjoy it and the people and I get to share lots of skills and teach people them as well. 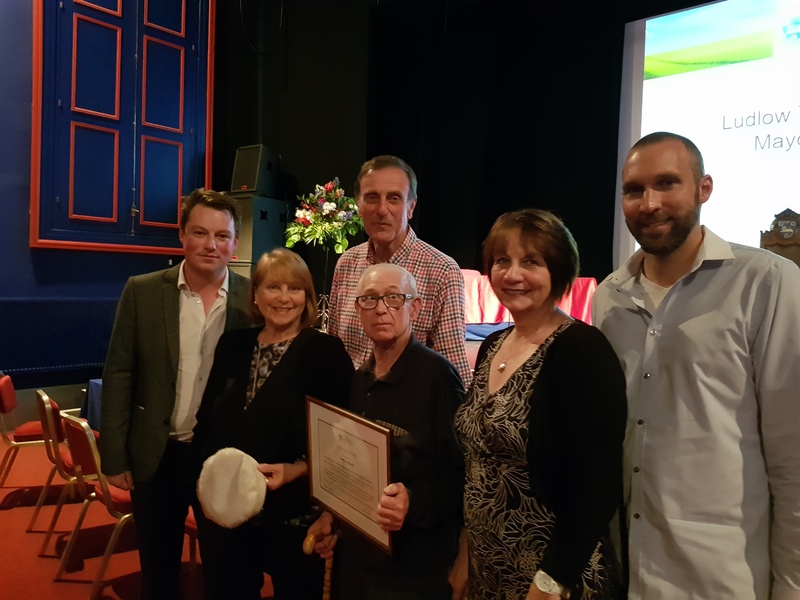 Terry was handed the Civic Award at the Ludlow Mayor Making Ceremony at Ludlow Assembly Rooms on Wednesday night (May 23). The father of three moved to Ludlow 15 years ago. He has been a decorator all his life, working in the industry from when he left school to when he retired at the age of 66. In his career he has decorated Bromsgrove Hospital and the Queen Elizabeth Hospital – and since joining The Furniture Scheme he has decorated the Renaissance store in Tower Street and the offices at Rockspring Community Centre in Sandford Road, inside and out. Di Hyde, Volunteer Coordinator at The Furniture Scheme, said Terry was an integral part of the charity. She said: “We are thrilled that Terry was chosen by the mayor Tim Gill as a recipient of the Civic Award. The Furniture Scheme was launched over 20 years ago as a way to ensure some of the most excluded members of the community could benefit from recycled household items – but the charity has grown and now offers computer courses, carpentry workshops and volunteering in the garden, among other things. Very well done to Gill Pitt on completing the hottest marathon ever, and a big thank you from all the team. Also a big thank you to everyone who sponsored Gill and raised over £1,500 which will go to the charitable work of the Furniture Scheme. Gill Pitt, Social Inclusion Manager for the Furniture Scheme, was running in the Virgin Money London Marathon in April 2018 to raise funds for The Furniture Scheme. Click below to watch the film which was launched at our Annual Celebration on 8th December 2017. Great news! Here at The Rockspring Community Centre, the first of six new CPADs (Community Public Access Defibrillators) has been fitted. 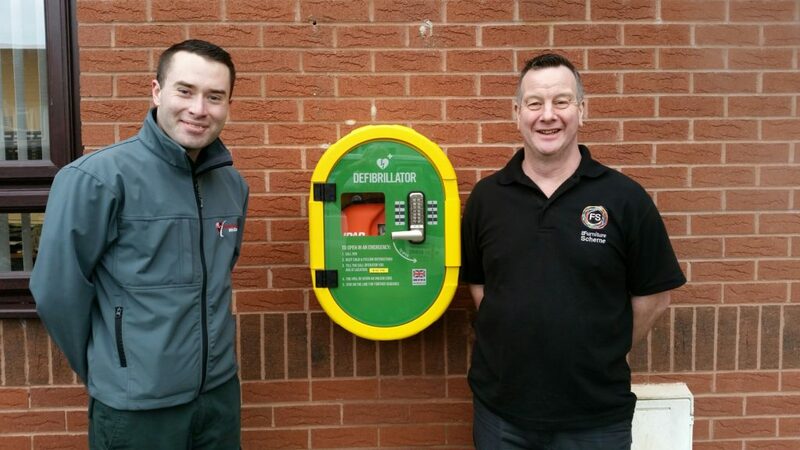 Thank you to Ludlow Defib 4 You for arranging this and to Ludlow Hospital League of Friends for their generous donation in purchasing the new AEDs and the tough, light weight, outdoor Defibrillator Cabinets – ‘DefibSafe2’. As well as Rockspring Community Centre the CPADs provided by The League of Friends will replace current machines at Ludlow Assembly Rooms, the Bishop Mascall Centre and Ludlow Homecare. Two extra machines will be sited at Tesco and to the North of the Town (Sheet Road/Parys Road to be finalized). Two of the existing Cardiac Science G3 AEDs will be rehoused in indoor locations – St Laurence’s Church and Ludlow Junior School. A charity shop in south Shropshire is to host its first ever art exhibition in the run up to Christmas. The gallery, showcasing local artists, will be at Renaissance in Tower Street, Ludlow, from Friday November 17th. Buscall Gallery Art Room Trust, a charity involved in Pop–Up Art Exhibitions, is teaming up with The Furniture Scheme, which owns Renaissance, to add a little colour to their shop and raise funds. BG Art has been based in Yorkshire for five years but owner Nicola Buscall has recently moved to Shropshire. She said: “I have worked with a range of partners staging exhibitions and running galleries in the Dales and Harrogate so I am very excited to start working in Shropshire. “The main aim is to promote the art of professional artists, particularly that of young talented artists and also that of mature but as yet unaccepted artists, making their art accessible to the public. “We have mainly been working in empty commercial space to keep our high streets alive but I was delighted when The Furniture Scheme said they would like to host an exhibition at their busy store. The Furniture Scheme supports local people in crisis or in need by selling second hand furniture, restoring donated furniture and selling books to raise funds for training programmes and starter packs for people in new houses. Renaissance will operate as normal during the exhibition with the art complementing the furniture displays. For further information on the project please contact Nicola on 07801 439555 or njbuscall@hotmail.co.uk. Work to create a new play area for children and groups in south Shropshire has now been completed thanks to a £10,000 grant. The Furniture Scheme, based in Ludlow, has installed the open space at CASCA (Community Arts Sports Craven Arms) Nursery – and they are now looking for more volunteers to help with the extra work. The improvements to the site in Newington Way have been made after funding from Awards for All and everyone is delighted with the results. Jean Jarvis, chief executive of The Furniture Scheme, said: “This money has been a huge boost, it has not only benefitted the children at the nursery but all community groups who can book to use it. “It’s flat to ensure those less able can access it and the new flooring means it can be used throughout the year regardless of the weather. The work was carried out by Clean Cut Services grounds maintenance, a social enterprise which is part of FUSE Enterprise CIC – a development company which sets up its own social enterprises working to help, support and encourage growth. Veolia also supported the project by offering a skip free of charge. But Ms Jarvis said the success of the charity and the continuing expansion of services on offer means the charity is in need of more volunteers. She added: “The Furniture Scheme was launched over 20 years ago as a way to ensure some of the most excluded members of the community could benefit from recycled household items – we now offer computer courses, carpentry workshops and volunteering in the garden, among other things, to help build confidence. “Many of our volunteers come to us with low self esteem and leave a different person, ready to take on new challenges. “It is great because people get confidence and leave us to get a job – but it means we need more volunteers. “We need people for roles like reception and helping us to set up rooms, there are many different things to do here and we will try to suit what volunteers are interested in. “Also we will always, where we can, put people into training and learn new skills. Anyone who would like more information about The Furniture Scheme or CASCA should call 01588 672847 or email casca@furniturescheme.co.uk or visit http://www.furniturescheme.co.uk.